Black Friday Sales are here! And we are offering a huge discount to the entire store. I hope you enjoy this final sale of the year! We are so thankful this holiday season for all the support you've given, and we are so happy to say thank you this weekend! In addition to wallpaper, prints and necklaces, we have sale items that are new as well as downloadable Christmas items! Happy Holiday season to you all, and enjoy! How's this for some happy friday news? 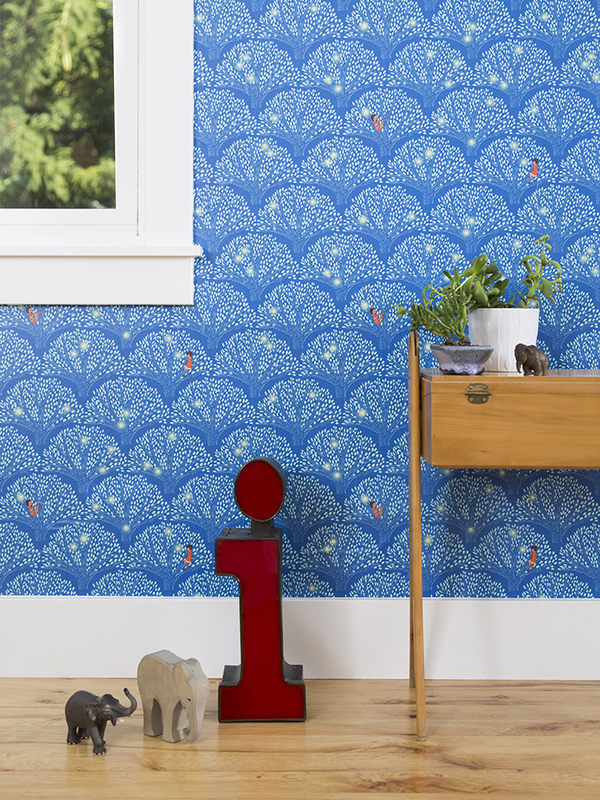 Design Mom is hosting a Giveaway of my wallpaper here. The giveaway ends today, or over the weekend...it's unclear...so hurry on over! I'm so excited to share more images of the wallpaper. It's been a dream to work with! Fabric wallpaper and decals that are peel and stick, removeable, reusable, wrinkle-out-easy, nearly impossible to rip (At least I haven't yet, and I've been pretty rough with them) made in the USA, eco-friendly and kid safe. The colors are gorgeous, and I honestly couldn't be happier with this new line! Have a lovely weekend! I'd love to hear which wallpapers are your favorite....And best of luck on the giveaway! I can't tell you how much I love coming across your amazing collaborations and creations with Wee Wander! Seriously now. It's baffling to me how much is going on in cottages and sewing rooms the whole world over, and I just get goosebumps when I come across your amazing work. These photos are a collaboration of Little Lizard Designs who designs sewing patterns for children. Like this teepee for instance. Adorable! And these dresses. So much to play with! Chasing Mermaids put together the photoshoot with the help of Claudia Blake Photography. You can see the full post here with all the details of the shoot...patterns, products, etc. Really you guys. These fabric collections are created with so much effort. I can't even begin to tell you the all nighters, the take out, the piles of laundry, the messy studio, the creative blocks, and just the challenge of putting my heart in print. It's just such an incredible process. One that I actually love for how much it stretches me and pushes my creative vision. So when I see your projects and your passion behind these fabric collections, I can't tell you how much it warms my heart to see so many of you use this in such beautiful ways. I love seeing you get inspired, and I love seeing your creativity! Thanks so much! (Can you tell I'm under the wire for deadlines as I write this? I may or may not have a studio begging to be de-cluttered and a house aching to be laundry-pile free as we speak). It's such an honor. Thank you! And thanks again LLK for sharing!